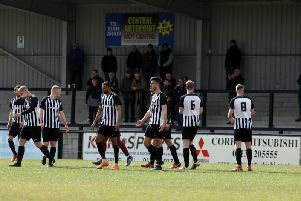 Tommy Wright is keen for his Corby Town first-team squad to gel as quickly as possible as they prepare for their opening pre-season friendly at Oadby Town next Tuesday night. Steelmen boss Wright took an under-23 side to take on Newcastle United under-18 team earlier this week and was impressed as Kurtis Revan’s second-half hat-trick saw them battle back from 2-0 down to win 3-2. Revan is now set to be part of the first-team set-up following that display. But Wright is ready to unleash his big guns for the first time next week as they gear up for the Vanarama National League North campaign, which gets under way with a trip to Curzon Ashton on Saturday, August 8. “We will get on with some ball work tomorrow (Saturday) as we prepare for Oadby,” Wright said. “I am looking forward to the game. I am sure they will have a go at us and that’s what we want, I don’t want us to be going and winning 5-0 or 6-0 and I don’t think that’s what will happen. “We picked Oadby for a friendly because we believe they will test us with a similar style of play that we will face in our league matches next season. “They will have some young, hungry players who will be keen to show what they can do. “From our point of view, it’s these early matches that will be crucial in getting the players gelled together.